The Amalfi Coast, which lies on the southern side of the Sorrentine peninsula, can rightfully claim to be Europe’s most beautiful coastline. Its coastal road winds around towering cliffs that fall dramatically into the sea. You have probably seen this slice of paradise in more than one film or ad, but nothing quite prepares you for the amazing beauty of the place. The Amalfi coast has enchanted visitors for centuries. Northerners were eager to leave the rain and darkness of England, Germany or Ireland in order to find this sunny clime. Featured here are three different yet appealing towns that you could visit starting from the north and journeying south along the coast. Looking down from our apartment in Praiano to the bay below. No one wants hordes of tourists to discover their secret treasure, but is it fair for me to keep a place secret, especially one that I stumbled upon by accident on the Internet over 12 years ago? Praiano won’t appeal to everyone, as it is a small town with no night life, no fancy shops or disco bars. But it has everything you need if you are looking for a relaxing vacation: beautiful views, friendly people, walking trails, fine hotels or apartments to rent, and excellent seafood, whether you dine in or cook it yourself. It isn’t overrun with tourists, making it a more appealing option than Positano or Sorrento to the north. This town has a life outside of tourism, yet tourists feel welcome and can easily buy fresh seafood from a local fishmonger, often catching a glimpse of the fisherman who sold his daily catch. 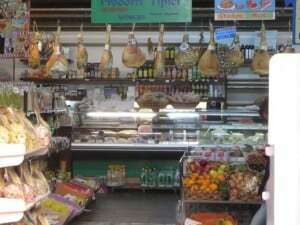 A deli in the heart of Amalfi, featuring hanging prosciutto and plenty of local products. Just east and south of Praiano is a city that is far from secret, but still quite a treasure. As the quote at the entrance to the main piazza of Amalfi says, “Judgment day, for those who will enter from Amalfi into Paradise, will be a day just like any other” (Renato Fucini). 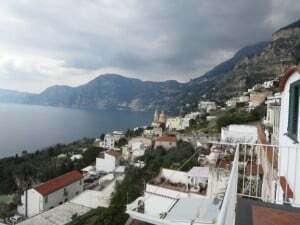 Living in paradise already, what more could heaven offer the citizens of Amalfi? The sun, the lemons, the sea and the beautiful tiled roof of the duomo make this an incredibly lovely place. You can take day trips from Praiano to Amalfi via a local bus to visit an ancient paper mill. Amalfitani are rightfully proud that their native city was one of the first places in Italy where paper was made. Or you can tour the ancient arsenal that dates back to early Middle Ages. It was famous and powerful before Venice became the maritime force. It is a clear reminder of Amalfi’s former might as a leading naval power. Here boats were crafted to vie with Pisa, Genova and Venice. 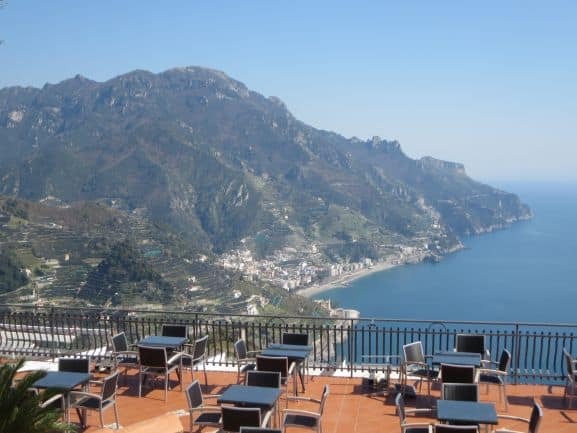 Visitors can try first-rate limoncello or the local pastries, such as trecce all’amalfitana, braided pastry with hazelnuts and almonds, or climb the many steep steps to visit the black and white straiated Amalfi duomo, which dominates the town’s main square. The Hotel-Restaurant Santa Caterina in Amalfi is also a jewel of its own. It is located just outside of town on the coastal road, and is a famous, expensive and beautiful hotel known for its great food and breathtaking terraces that dot a cliff high above the sea. It is said that each terrace is filled with a garden and that you enter each one as you descend to the water. As a famous visitor once said, “Sweet the memory is to me, Of the land beyond the sea, Where the waves and mountains meet; Where amid her mulberry-trees, Sits Amalfi in the heat” (Henry Wadsworth Longfellow). A view from a café at the entrance to Ravello looking down on the coast below. Ravello, like neighboring Amalfi, was once an independent republic and for a time was under the purview of Amalfi. It is now a glorified village with an unrivalled view of the Mediterranean Sea, situated 335 meters above sea level. It is well worth the 30-minute bus ride, during which you can view steeply cultivated terraces and the incredible coastline. Like most of the Amalfi coast, Ravello is not an undiscovered location. Richard Wagner, D.H. Lawrence, Humphrey Bogart, Jacqueline Kennedy Onassis and Gore Vidal are a few of the celebrities who frequented this former jet-setting place. In the summer months when the Villa Rufolo hosts its international music festival, there will be a cosmopolitan feel to the place. The brochure that you receive as part of your €5 entrance fee to the villa says that “in the 13th century it could boast more rooms than there are days in the year.” The terrace offers commanding views of the nearby Latteri Mountains and Mediterranean Sea.